To get an inside scoop on how to disguise blemishes the right way, we turned to BECCA’s Style Director and National Makeup Artist, Kerry Cole. Here, four tips for girls who have acne-prone skin—or just get the once-in-a-blue-moon breakout. MORE: Ask an Expert: Should I Be Using Skin Lightener? Go green—with your primer, that is. Cole recommends using primer that reduces redness and/or calms your skin, and a green-based formula is the way to go. Wanting to avoid adding color on top of splotchy skin is understandable, but you don’t necessarily have to forgo a rosy glow or sun-kissed complexion. 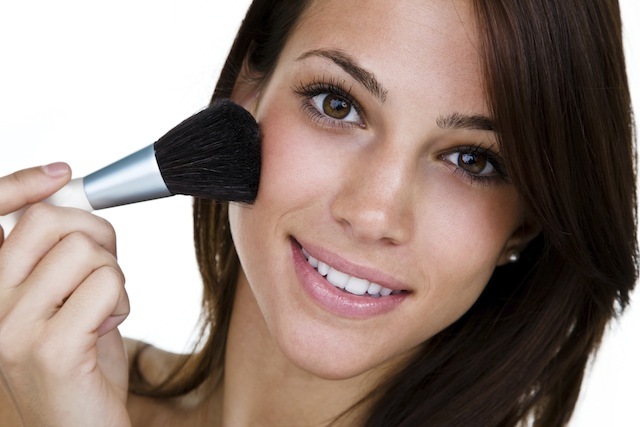 Girls with acne-prone skin can definitely wear blush and bronzer, says Cole. The trick is to avoid glittery or sparkly formulas—these kinds of products can make imperfections look worse and call attention to pores. Swap out the shimmer for a matte version to add some healthy color to your face—without highlighting your acne. Sure, they look innocent enough, but sponges can actually do more harm than good. “These can breed and spread bacteria, which can ultimately lead to additional breakouts,” says Cole. Go for makeup brushes—she recommends BECCA’s One Perfecting Brush, which is naturally antimicrobial—and make sure you keep them clean!